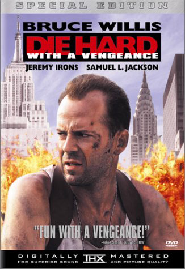 In the movie Die Hard 3, our heros, John McClain (Bruce Willis) and Zeus (Samuel L. Jackson), are at the bidding of the evil Peter Krieg (Jeremy Irons). First they are sent to the pay phone, then to the subway, and finally to the park. It is here that they must make exactly four gallons from five and three gallon jugs. They did it just in time. How did they do it? The steps are simple, once you see them. (1) Fill the five gallon jug. Three gallon jug is empty. 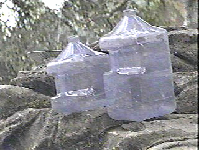 (2) Empty three gallons from the five gallon jug into the three gallon jug. (3) There remains two gallons in the five gallon jug. Empty the three gallon jug. 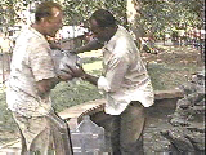 (4) Pour the two gallons into the three gallon jug. 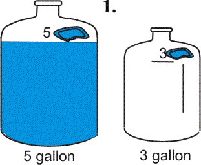 (5) Fill the five gallon jug and pour one gallon from it into the three gallon jug - filling the three gallon jug. (6) Four gallons remain in the five gallon jug. We have solved the problem. Problem. Given and 11 gallon and a 4 gallon jug. Make exactly one gallons. Can you follow these steps? Thus we have exactly one gallon. Also, we can obtain gallons. Along the way we have made every number of gallons, from one to eleven. There a much quicker way to get the eight gallons? What is it? This highlights the problem and shows that we must have jugs with relatively prime capacity to accomplish the task. You can see that if and are not relatively prime, then any such combination will have the divisor given by the greatest common divisor. (It could have other divisors, as well. We now have an application of a theorem of abstract number theory to a practical problem of capacity and achieving a certain volumetric measure. This is higher mathematics at work. We could also apply this to length measurement. Suppose that you have sticks of exactly five meters and seven meters in length. Then it is possible to make any integer-meter measurment. How? Use the result above to make any measurement up to six meters. Then add the seven meter stick to get any integer length up to 13 meters. Add the seven meter stick again to get any integer length up to 21 meters, and so on. Given a 7 gallon and a 3 gallon jug, obtain exactly 5 gallons. Given an minute egg timer and a minute egg timer. Show how to boil a minute egg. Show how to boil an egg for any number of minutes. (Hint. 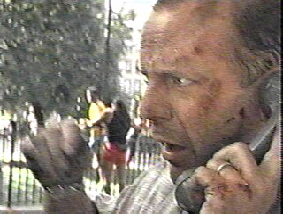 This problem is very much like the Die Hard problem. Join the following array with exactly 4 straight lines without lifting your pencil and without tracing over a segment already drawn. Show me the solution. Can you figure out how to plant 7 rosebushes so that they form 6 different straight lines with 3 rosebushes in each line?